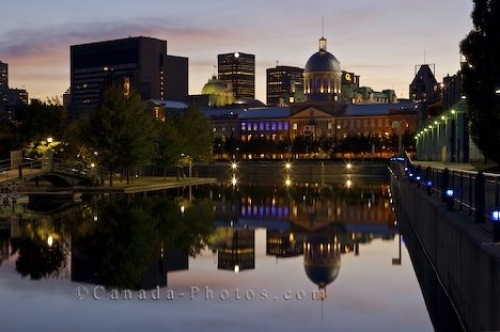 Looking across from the Bonsecours Basin in Old Montreal and Old Port in Montreal, Quebec, the reflections of the Bonsecours Market and the downtown buildings sparkle in the stillness of the water at dusk. Bonsecours Market is a very important heritage building in Montreal city, Quebec which seems very peaceful at dusk but during the daylight hours, people are constantly coming and going from the building. Picture of the dusk lighting and the reflections of the Bonsecours Market and the downtown buildings in Montreal, Quebec. ... The reflections and twinkling lights create a magical aura which become more defined as the hours of dusk pass and darkness settles in. Bonsecours Market, Marche Bonsecours seen from the Bonsecours Basin at night in Old Montreal and Old Port, Montreal, Quebec, Canada.